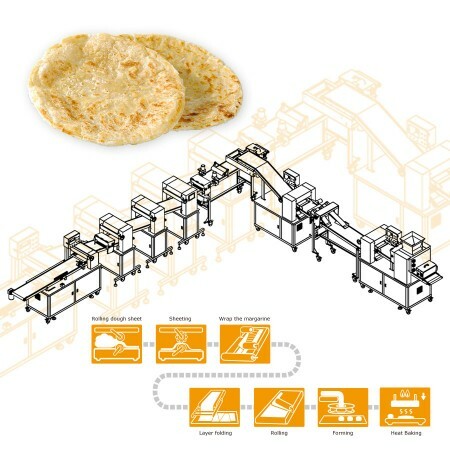 ANKO Automatic Layer & Stuffed Paratha Production Line - High Quality Automatic Layer & Stuffed Paratha Production Line Manufacturer from Taiwan | ANKO FOOD MACHINE CO., LTD.
ANKO - The best Layer & Stuffed Paratha Production Line manufacturer. We always commit to the development and focus on the quality of our machinery. LP-3001 is fully automatic to produce similar products such as paratha, pie and the like. Placing well-mixed dough and margarine into hoppers is the only thing to do. Then the fully automatic production processes include dough pressing, margarine extruding, the first folding and sheeting, the second folding and sheeting, rolling, cutting into balls, and pressing to form tasty products. 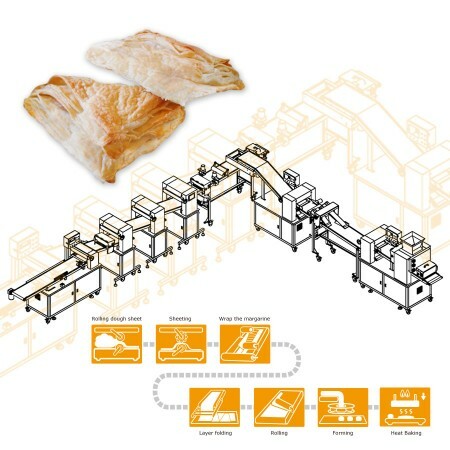 When the production line equips a filling machine, LP-3001 can form various tastes of stuffed pastries, such as curry pastries, barbecued pork pastries, bean paste pastries, etc. Put dough into hopper. Rollers form dough into dough belt. Sheeting rollers set sheet dough belt thinner and even without destroying texture of dough. Margarine is extruded onto the dough belt. Through a wrapping mechanism to wrap margarine inside dough sheet, Margarine will not leak out to destroy layers of pastry. Expanding folding mechanism swings dough belt with margarine inside onto the delivering conveyer to make layers of pastry. Rolling mechanism rolls up dough belt into a dough bar by means of speed difference between special roller and conveyer. In addition, it can be equipped with an extra stuffing extruder to make an stuffed dough bar. The plain or stuffed dough bar goes through the wrapping mechanism to be formed into dough balls. Both ends are closed to keep from stuffing leaking and keep the layers.